As Bamboo’s Rose’s resident tech geek, I love seeing how technologies like machine learning and artificial intelligence (AI) are changing and enhancing the retail industry. There are so many opportunities for retailers to leverage these technologies to improve efficiencies and innovation throughout the supply chain. While we could spend hours talking through the hypothetical applications or potential future uses, I’d like to explore the current, tangible ways that AI and machine learning are impacting retailers now – and some of the ways organizations are using this technology to improve their bottom lines. One of the most significant benefits of AI/machine learning is how it speeds everyday processes and creates efficiencies, giving retail professionals back the most important resource – time. Having the time to be creative and innovate is crucially important today, as the industry grapples with rapidly changing consumer preference and increased competition. So, how does AI/machine learning save time? Right now, we’re seeing retailers automate parts of the design process to cut time out of concepting cycles. For example, Bamboo Rose uses image recognition capabilities to develop a color palette in seconds, based on photos that a designer takes of anything he/she finds inspiring – a process that, when done manually, can take days or weeks to complete. Machine learning’s impact on assisting retailers in selecting better partners and suppliers — key elements of supporting the bottom line — is incredible. The Bamboo Rose platform, for example, has the ability to scan preferred supplier behavior for things like delivery accuracy, close collaboration and speed to create a profile and then use that to flag potential new suppliers that would be a good match. According to our recent survey of retail and supply chain professionals, 93 percent noted they work with at least one new supplier each year, and more than half said they work with five or more. At that rate, being able to identify strong supplier matches means faster onboarding time and lower risk throughout a supply chain. Retailers who embrace technology are constantly collecting data to inform their customer experiences; innovative retailers are using that same data to improve the supply chain by applying predictive analytics. For example, predictive analytics can use buying patterns over time to forecast inventory needs with greater accuracy, allowing retailers to better manage sourcing and stocking processes. It can also run simulations on a company’s supply chain to determine the impact of various possible disruptions – like weather for instance – and help create alternative paths to avoid downtime or product loss. Each day we’re seeing more uses of AI and machine learning to advance the retail supply chain – in fact, IDC analysts predict that 40 percent of retailers will have developed a customer experience architecture supported by an AI layer by 2019. At Bamboo Rose, we’re staying ahead of tech trends to help retailers compete at consumer speed by integrating new technologies into our vendor agnostic platform. Learn more about Bamboo Rose’s capabilities and integrations with our latest “cool tools” product update. Kamal Anand has deep experience in supply chain and global sourcing software development. He drives the Bamboo Rose product technology strategy. 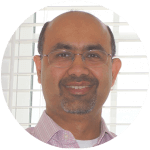 Kamal is an avid traveler and enjoys playing the role of soccer coach and Lego builder with his 2 sons.